Last week I went to Seattle to visit FreeFly Systems, makers of the CineStar multirotors like the one I've been test-flying with custom motor controllers. It was my first trip to Seattle, or to the West Coast for that matter. I finally got to see some of the mountains that Tyler is always talking about. One of the cool things I got to see in person is the CineStar 6 Heavy Lift configuration, seen here lifting a 30lb payload, or as the commenters suggest, "2 [RED] epics for 3D," or "like 90 go pro's." It's the same frame as the regular CineStar 6, but with beefier motors and bigger, more efficient propellers. As such, it should make a good load test for my FFv1.1 motor controllers. The goal would be closed-loop speed control tuned for that particular motor and propeller with an inner FOC current-control loop to keep everything happy and efficient. 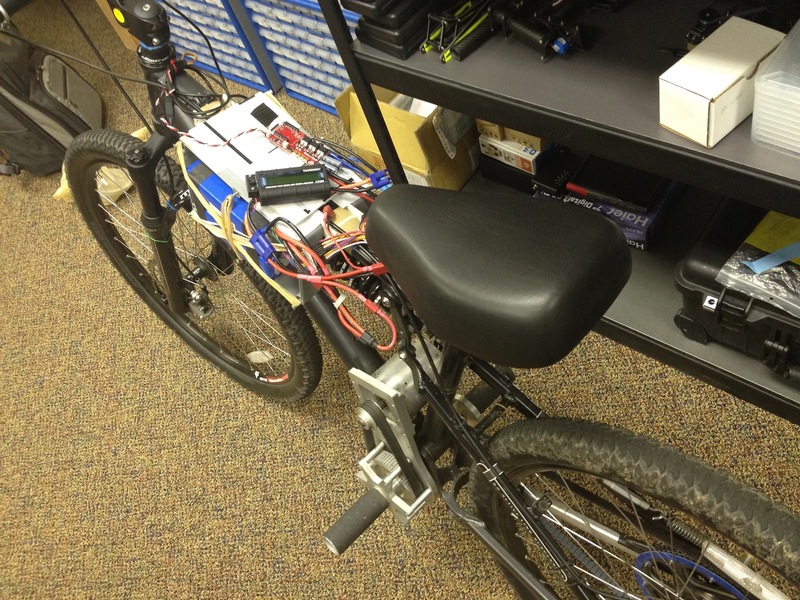 This custom e-bike has every possible thing going against it as far as motor control is concerned. It's sensorless, so the controller has to ramp start. The motor has an integer slot, full-pitch winding, so there's massive cogging torque and the back-EMF is very trapezoidal. It's aggressively geared for about 35mph on 22.2V, so it requires a lot of current. That's okay for the motor, since it's got very low resistance and inductance, but the controller won't be happy about it. Probably the hardest part for the controller, though, is the freewheel. Ramp starting into a freewheel is not fun, and push starting like my scooter is impossible. After a couple of days of tweaking and pushing the current limits up and up, we got it to ramp with about 75-100A and run with 50-75A, though not reliably. It was a good test of the hardware and ground firmware, though, and I'm sure it would have no trouble running Pneu Scooter now. It's a lot smaller than my 3ph controller line, so I might actually use it. 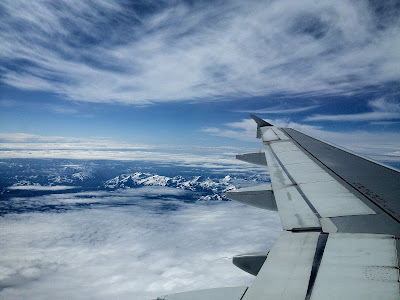 Most of the trip was related to flying things, though. 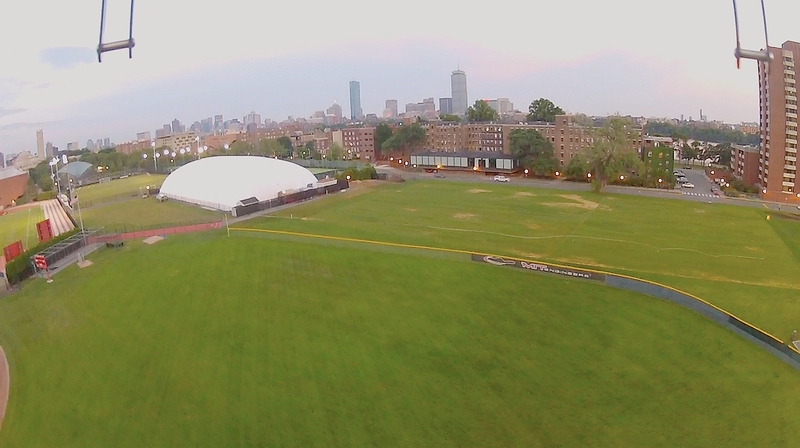 Seattle and especially the surrounding area is a much more scenic place to fly things than Boston/Cambridge. If only the weather was nicer. 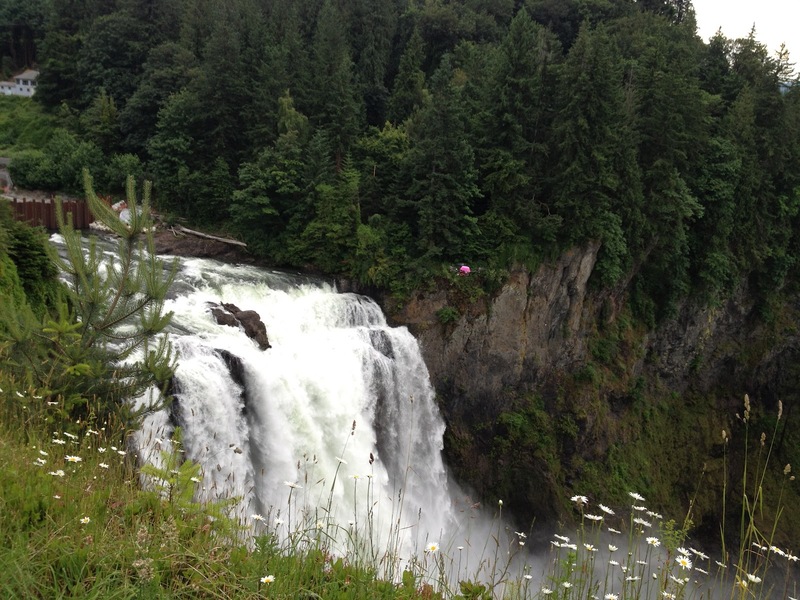 We took a trip to Snoqualmie Falls one day in search of a spot to fly things. What's that pink thing hovering around out there? Some kind of bug? Overall, it was a fun and productive trip. I have some new directions to move in with the FFv1.1 controllers, which I'll be updating shortly. I'll be focusing on closed-loop speed control modes and a user-friendly configuration tool that will make setup much easier. I also plan to make a more compact power-side layout for lower-current applications like my Talon quad and other things. Speaking of the Talon quad, when I got back from Seattle, I had three brand new KK2.0 flight controllers from HobbyKing waiting for me. The KK2.0 is a big step up from the original KK for not much more cost ($30 for the new one). It has a nice LCD screen and menu system for configuration, so no more firmware uploading and no more trimpot gain setting. It also has a three-axis accelerometer now, enabling self-leveling and "height damping." The self-leveling feature is useful, but I would stop short of calling it attitude control. The sticks still command rotation rate, and the self-leveling acts over a long period of time to get back to level. True attitude control would have the sticks commanding angle and the quad would snap back to level "instantly" when the stick is centered. Even the slow self-leveling helps, though, when you're high up and can't easily see the attitude. And the height damping from the z-axis accelerometer is nice. It makes manual altitude holding a lot easier. I have been following your site for some time, and little by little I have progressed to the point that I could even start to think about doing a brushless controller project. I was going through some past posts trying to wrap my head around the general principles of the hardware design and I was wondering if sometime you might dedicate a post (or point me to a comprehensive site) that talks about design of a BLDC controller from a hardware perspective. I am not an EE, just an AE trying to mechanize some of my designs. Some of the things that I am still trying to wrap my head around are what are important specifications for FET's, Predrivers vs Optocouplers vs 5V compatible gates (can these be driven straight from the micro controller), Micro controller (things like number of pwms, and other onboard hardware devices that make life easier), and lastly other misc devices such as hall effect sensor types/requirements. Just found your 3phduo notes, perhaps most of my questions will be answered there. Does this theme has to do with your professional position or perhaps is it mostly about your hobbies and kinds of spending your free time?